Just about a year ago, Newsweek came out with an article on interesting types of Google searches and Google cooking was one of them. Now you may be thinking it was just a quirk, one of those odd techy news stories about something that filled space for a day and then dropped out of sight. But you'd be wrong, or at least missing out on a lot of very good, and sometimes great meals. One year later I Google cook more often than ever and recommend it for a number of reasons. First, it's a way to use up those odd food purchases that seemed like a good idea at the time but when you got home you didn't know quite what to do with them. Second, it encourages food diversity, when a particular food combination unknown in the US is found to be common in some other part of the world. And third, it's good economics. Whatever variety your refrigerator and cupboards hold, Googlecooking can help you figure out a way to use it. 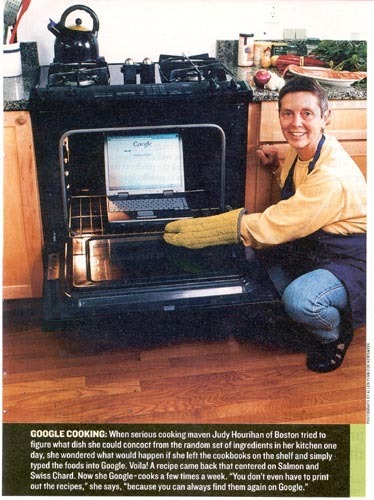 So join me now in the Googlecooking revolution. I'm sure you'll be pleased with the ease and results. This page contains a single entry from the blog posted on December 12, 2003 10:31 PM. The previous post in this blog was Snow Removal Daze. The next post in this blog is Shortened Tradition.